Residents refer to the vacant limestone townhouse at 266 West End Ave. as the "spook house." The house has not been granted landmark status and is not protected against developers. 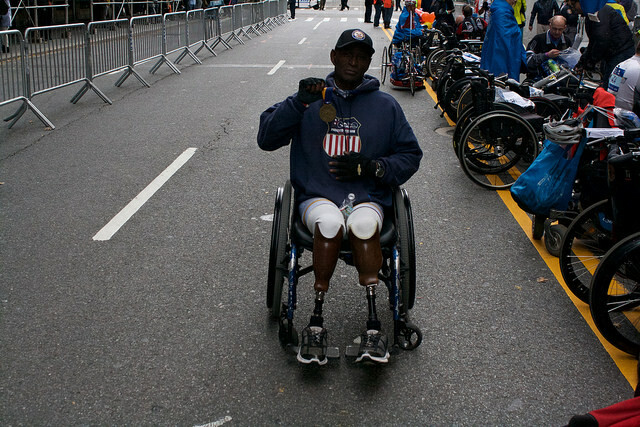 Photo by Kathryn Kattalia. Topping out at only five stories, the empty townhouse at 266 West End Ave. still seems to loom over passers-by who stop to take in the detailed molding that crowns each long, rectangular window facing the quiet residential street. Youthful-looking cherubs carved out of limestone perch above the arched doorframe, oblivious to the dark tinge which time has left on the building’s century-old façade. According to some neighborhood historians, it’s a treasure—a beautifully preserved piece of architecture dating back to the 1890s when development first hit Manhattan’s Upper West Side. Calise, 47, has lived across the street from the spook house for 42 years in an apartment building where he now works as superintendent. 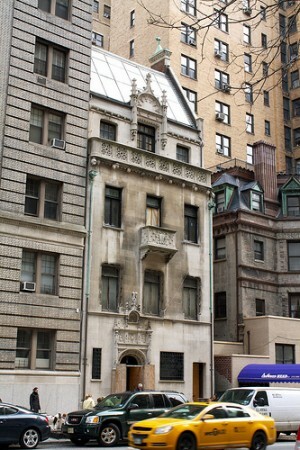 Standing outside the canopied entrance to his own building—a 15-story deluxe apartment house with terra cotta trim completed in the 1920s—Calise said the spook house is a part of old New York that has long been at the mercy of modern day developers who come armed with blueprints for shiny high-rises. And yet, it’s a threat all too real for some who live on West End Avenue, who say outside builders are destroying the character of a neighborhood whose architectural streetscape is unlike any other in the city. A group of residents have taken their concern to the New York City Landmarks Preservation Commission, asking that the residential stretch of avenue between West 70th Street and West 110th Street be designated a historical district. The area, which would include cross streets and parts of Broadway, would be an extension of a current Upper West side historic district that covers parts of the West End between 87th and 94th Streets. 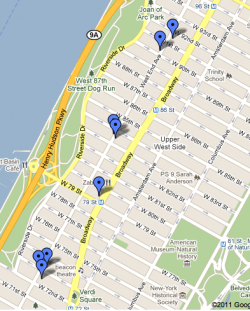 A map of the historical apartments, brownstones and row houses along West End Avenue on the Upper West Side at risk of being torn down by developers. Courtesy of Google maps. To become a historic district, the Landmarks Preservation Commission looks to see if an area possesses a unique and cohesive aesthetic that contributes to the city’s cultural and architectural history. If the plan passes, all new housing projects, development and renovation work in that zone would have to be approved by the landmarks commission. The commission is currently holding a series of public hearings to debate the merits of designating the proposed area as a historic district, which would be one of the largest in New York City. While some developers argue having a historic district will be detrimental to the neighborhood’s growth, for many residents the decision to preserve West End seems obvious. It was a hot July day in 2007 when 75 West End residents crowded into a neighbor’s apartment to discuss disturbing changes they had noticed along the avenue. Developers had torn down two turn-of-the-century brownstones between 95th and 96th Streets, and a sleek new apartment complex was going in where another townhouse once stood on the corner of 86th Street. More were scheduled for demolition on 84th and 85th Streets. Erika Petersen, a West End resident of 40 years, said she still cringes when she thinks about it. They decided to form the West End Preservation Society, a group that would try to save the neighborhood by appealing to the Landmarks Commission for help. They asked Andrew Dolkart, a professor at Columbia University, to do an architectural survey of the buildings along West End Avenue to see if there was a chance the whole neighborhood might qualify as a historic district. What he found came as a surprise to some. In the final study presented to the commission, Dolkart concluded that the neighborhood was not only of architectural interest; it illustrated a unique shift in historical housing trends. Ornate brownstones, townhouses and row houses popular in the 1890s lined the street, broken by some of the city’s earliest high-rise brick apartment buildings of the 1920s. West End Avenue was a well-preserved timeline of how residential development had evolved in New York City. It only made sense, he said, to protect it. 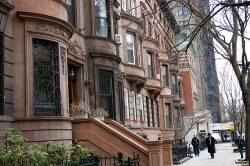 A row of brownstones dating back to 1896 line the block of West End Avenue between West 90th Street and West 91st Street. Photo by Kathryn Kattalia. Since then, other existing preservationist groups have been eager to join the fight to win historic status for the neighborhood. Cristiana Pena, director of community outreach Landmark West, an organization that for decades has worked to gain landmark status for dozens of Upper West Side buildings, said the proposed historic district included buildings the group has been trying to preserve for years. But as the Landmarks and Preservation Commission inches ever closer to a decision, some argue that what’s sensitive to history is not necessarily what’s best for the neighborhood. Some have voiced their opposition, claiming that a historic district would impede residential development vital to the city’s growth and hurt homeowners in the long run. Michael Slattery, senior vice president of the Real Estate Board of New York, said the push for a historical district is less about preservation than it is about controlling development. Even worse, he said, is the freezing effect the historic district status will have on providing additional housing for a growing neighborhood. He said he also wondered at the size of the proposed district, adding that many of the buildings that would be protected have little historic significance. The Landmarks and Preservation Commission has already hosted one public hearing and plans on holding two more to get input from the community before voting on whether or not it will designate the proposed area a historic district later this year. Should the commission decide to move forward with the plan, it must then be approved by City Council. The next hearing will be in June 28. And while Petersen said there’s no telling what the outcome of the hearing might be, she is confident the Landmarks and Preservation Commission will be in favor of preserving what’s left of West End. She said the move to make the area a historical district has already gathered support from Manhattan borough president Scott Stringer’s office, as well as Upper West Side city council representative Gale Brewer. 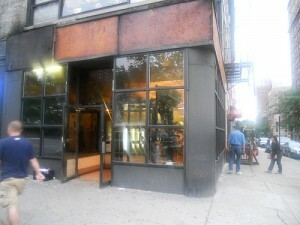 Until the council votes on whether or not to make the area a historic district, the Landmarks and Preservation Commission has granted temporary protection to West End Avenue to prevent any further modification to its streetscape—a move that comes just in time, Petersen said, as developers have been looking to put up another 22-story apartment complex at 86th Street.